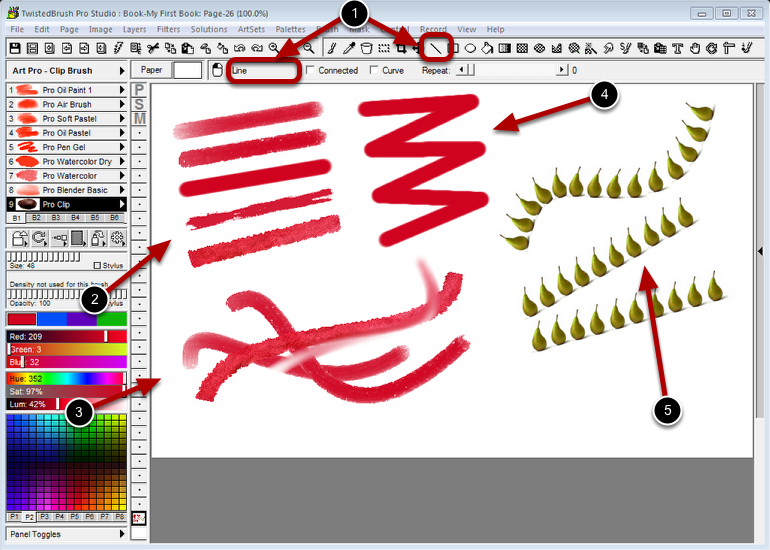 The Line tool uses your currently select brush to draw straight or curved lines. The basic line with a few different brushes selected. The line tool with the connected option to connect each line segment together. Here the Line tool is use with the Pro Clip brush. When the Connected option is checked each line will start at the end point of the previous line. The Curve option allows for drawing curved lines. First stretch the line extents then click and drag to place the first control point and then click and drag to place the second control point. The Repeat option is an automation option. If set above 0 after drawing a line randomly placed duplicates will be drawn on your page.